From Brownfield to Neighborhood Park! In the six years it took to make Scarito Park a reality, hundreds of people and scores of public agencies were involved in decision-making, problem-solving, and trouble-shooting to move the project forward. Throughout this time, Groundwork Lawrence served as the catalyst and manager of the project, helping to coordinate community outreach; environmental investigation and remedial activities; site design and planning; legal and real estate transaction work; fundraising; project permitting; construction; and volunteer involvement. 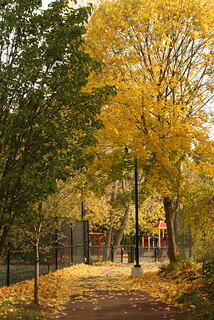 Thanks to the strong commitment and leadership of City and State officials, Lawrence CommunityWorks, neighborhood residents, and Bank of America, Scarito Park opened in 2006 and stands today as a shining example of the value that a beautiful, community-designed open space can bring to a neighborhood. It is also the first new park to be completed as part of the Spicket River Greenway. Read about the site's Brownfield transformation here!